What are the Fundamental Forces in Nature? There are four universal or fundamental forces in nature. Without these forces, all matter in the world will fall apart. Force as such is any pull or push that causes an object to alter its physical state (in terms of motion or deformity). Newton defined a force as anything that causes an object of mass ‘m’ to move with an acceleration ‘a’. A brief overview of the four fundamental forces is given below. Gravitational Force: Why is the universe not filled with floating human beings and cows and cars and other such things? Obviously because the gravitational force of the earth holds us to the planet. Gravitational force is the force responsible for holding planets in their orbits and this is possible only because of their infinitely long range. G = Universal gravitational constant. m1 and m2 are the masses of the objects in consideration. r = Distance between the centres of the two objects in consideration. When considered for massive objects, like the sun, or giant planets, gravitational force is considered to be strong as the masses of these objects are also large. On an atomic level, this force is considered weak. Electromagnetic Force: A fundamental force in nature, the electromagnetic force acts between charged particles and is the combination of all electrical and magnetic forces. The electromagnetic force can be attractive or repulsive. It has infinite range, although its strength is inversely proportional to the inverse square of the distance (that is, doubling the distance between two charged particles decreases the force between them by a factor of four). 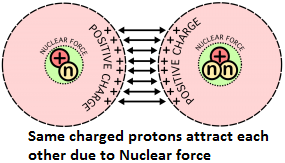 Aside from gravity, the electromagnetic force is responsible for all forces we experience directly (the only other two known fundamental forces are the “strong force” and the “weak force,” which hold together the particles in the nucleus of an atom). For example, the electromagnetic force holds atoms together in molecules, causes friction, and attracts iron to a magnet. Strong Nuclear Forces: Out of the four fundamental forces, nuclear forces are the strongest attractive forces. Electromagnetism holds matter together, but there was no explanation on how the nucleus is held together in the atom. If we consider only electromagnetism and gravity, then the nucleus should actually fly off in different directions. But it doesn’t, implying that there exists another force within the nucleus which is stronger than the gravitational force and electromagnetic force. This is where nuclear forces come into play. Strong nuclear forces are responsible for holding the nuclei of atoms together. Weak Nuclear Forces: Weak nuclear forces are responsible for the radioactive decay, specifically the beta decay neutrino interactions. It has a very short range (less than 1 fm) and this force is, as the name suggests, weak in nature.